35mm PL Mount "Film" Lenses including Zeiss Super Speed Lenses, Zeiss Ultra Prime Lenses, Cooke Series 4 Lenses, Cooke and Angenieux Zoom Lenses. 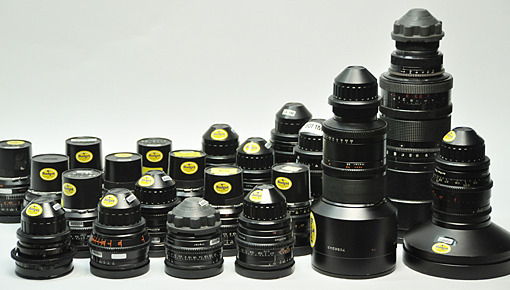 We have every Zeiss, Cooke, and Angenieux PL Mount lens. - Fast T1.3 Aperture for Shallow D.O.F. The Zeiss Compact Prime CP.2 35mm/T1.5 Super Speed PL Mount is a fast cine prime lens designed for filmmaking and video production applications. It shoots remarkably well in low-light. Aside from great optics and mechanics, the lens offers broad flexibility in the areas of camera compatibility, follow-focus compatibility, and shooting capacity. The fast T1.5 does so well in low-light, night and non-bright outdoor environments, that it allows filmmakers to conveniently pursue more creative shots in low-light, especially with high ISO DSLRs and camcorders. The outstanding handle of low-light also serves to limit the need for artificial light and thus allows more mobile filmmaking and delivers more natural-looking scenes. The fast aperture additionally offers more creative possibilities when aiming at a cinematic shallow depth of field. The lens also offers follow-focus flexibility. Across the entire CP.2 family, the front diameter is consistent, focus and iris gears are standard, and the housing is cine-style, offering thus compatibility with all standardized follow-focus systems. The Zeiss Compact Prime CP.2 50mm/T1.5 Super Speed PL Mount is a fast cine prime lens designed for filmmaking and video production applications. It shoots remarkably well in low-light. Aside from great optics and mechanics, the lens offers broad flexibility in the areas of camera compatibility, follow-focus compatibility, and shooting capacity. The Zeiss Compact Prime CP.2 85mm/T1.5 Super Speed PL Mount is a fast cine prime lens designed for filmmaking and video production applications. It shoots remarkably well in low-light. Aside from great optics and mechanics, the lens offers broad flexibility in the areas of camera compatibility, follow-focus compatibility, and shooting capacity. Featuring 14 high-precision blades, which create a consistently round and symmetrical iris opening over the entire T-stop range, the lens ensures uniform out-of-focus highlights and a smooth bokeh. T* Anti-reflex coating and internal light traps help suppress disturbing flares. The Compact Prime Cine Lens features a unique lens design that helps provide enhanced contrast, resolution and color rendition, and reduces distortion. Markings for distance are given in feet. Note: Unlike the larger CP.2 lenses, the 18mm/T3.6 does not cover full-frame 35mm sensors. On cameras such as the Canon 5D Mark II, vignetting will occur. The Zeiss Compact Prime CP.2 21mm/T2.9 Cine Lens (PL Mount) is part of the second generation of CP cinema lenses that were the first to offer full-frame 35mm coverage of large sensor DSLRs (such as the Canon 5D Mark II). The Compact Prime CP.2 lenses cover a full-frame image format without vignetting. The iris opening of the Compact Prime CP.2 lenses is created by 14 high precision blades. It stays consistently round and symmetrical over the entire T-stop range. This translates into natural and pleasing out-of-focus highlights and a smooth bokeh. Together they help create and capture special moments on film. The Zeiss Compact Prime CP.2 25mm/T2.1 Cine Lens (PL Mount) is part of the second generation of CP cinema lenses that were the first to offer full-frame 35mm coverage of large sensor DSLRs (such as the Canon 5D Mark II). The Zeiss Compact Prime CP.2 28mm/T2.1 Cine Lens (PL Mount) is part of the second generation of CP cinema lenses that were the first to offer full-frame 35mm coverage of large sensor DSLRs (such as the Canon 5D Mark II). The Zeiss Compact Prime CP.2 35mm/T2.1 Cine Lens (PL Mount) is part of the second generation of CP cinema lenses that were the first to offer full-frame 35mm coverage of large sensor DSLRs (such as the Canon 5D Mark II). The Zeiss Compact Prime CP.2 50mm/T2.1 Cine Lens (PL Mount) is part of the second generation of CP cinema lenses that were the first to offer full-frame 35mm coverage of large sensor DSLRs (such as the Canon 5D Mark II). The Zeiss Compact Prime CP.2 85cm/T2.1 Cine Lens (PL Mount) is part of the second generation of CP cinema lenses that were the first to offer full-frame 35mm coverage of large sensor DSLRs (such as the Canon 5D Mark II). The Zeiss 15 - 30mm CZ.2 Compact Zoom Lens in PL mount with focus markings in feet is a short wide-angle zoom lens for production shooting on formats from Micro Four Thirds to Full-Frame sensors. Optimized for digital cinematography, the zoom lens supports 4K resolution and is colormatched to available Zeiss primes for seamless intercutting between zoom and primes. The lens features internal mechanical adjustments built into a cine-style housing that minimize focus shift across the zoom range. Built-in lens gears on the zoom, focus, and iris rings, allow you to use available follow focus and zoom motors (not included). The lens features a circular iris for natural looking out of focus highlights, with easy to read focus scales calibrated in feet. The lens covers the full frame aperture, allowing you to use this lens on a variety of formats from Four Thirds through Full Frame. The lens features nearly 300 of focus rotation that provides for extremely accurate focus pulls. The interchangeable lens mount allows you to change the original mount your lens came in. Optionally available mounts are Sony E, Canon EF, Nikon F, and MFT. T* anti-reflex coating and internal light traps suppress flare for a sharp image with good contrast. Colormatched to seamlessly intercut with Zeiss Master Prime, Ultra Prime, Compact Prime Lenses, and other CZ.2 zoom lenses. Converted by Century Optics from a Cooke 20-60mm, this short zoom lens has a physical length of 10 inches and a front opening of 120mm. - Minimum focus: 28 in. The Optimo lightweight hand-held zoom lenses - including the 15-40mm, 28-76mm, and 45-120mm - offer a superb balance between quality and agility. They are the lightest and the most compact series of cine zoom lenses in the industry and are perfectly suited for shootings requiring modern, lightweight and compact digital cameras and Steadicam work. - Precise and ergonomic focus ring with scale rotation of 320 degrees & over 50 focus marks. Setting the standard for optics technology and performance, the Optimo line offers a range of zoom lenses to meet the most uncompromising requirements. Manufactured with exquisite precision, they help you bring greater artistry and cinematic expression to your production in any format. The Optimo long lenses are unrivaled as the industry's reference lenses for every type of production from feature films, commercials, TV series and video clips to major sports events and concerts. - Superb image quality from T2.6 open aperture, considered as "variable prime"
- Superb image quality from open aperture, considered as "Variable Primes"
The Angenieux Optimo 24-290 is the industry standard for high performance optical quality, offering brilliant clarity in an extreme focal range at a fast aperture. Close Focus from Lens Front: 27.6"
Close Focus from Lens Front: 1.73"
Front of Lens to Image Plane: 6.16"
Minimum Marked Object Distance: 8"
Length from Front to Lens Mount: 4.12"
Weight1.05 kg / 2.3 lbs. Close Focus from Lens Front: 31.6"
Front of Lens to Image Plane: 7.8"
Minimum Marked Object Distance: 42"
Length from Front to Lens Mount: 5.75"
Weight1.5 kg / 3.3 lbs. Cooke Anamorphic/i lenses feature standard Arriflex PL Mounts. They offer a linear iris and anamorphic characteristics including 2:1 oval bokeh for out of focus highlights. This Cooke MACRO Anamorphic/i 65mm Prime Lens offers a linear iris with max. aperture of T2.6, anamorphic 2:1 oval bokeh for out of focus highlights, and weighs 11.5 lb with MOD at 18". The 20-120mm covers S35 sensor size (Super 35 Film Format - 24.84 x 13.97mm) PL 20 - 120mm on a digital cinema style camera. While sensors on standard broadcast cameras are all the same size, sensors on digital cine cameras vary greatly. This new zoom ensures the image captured will cover large sensors for optimal, full-frame resolution. A nine-blade iris part of the design as well, creating the most natural-looking imagery possible.